In a globalised and borderless world, increasingly sophisticated investors are demanding greater transparency, lower fees and better performance. An efficient mutual fund platform with the world's best fund managers and access to a wide range of investment strategies and products is integral for wealth managers to deliver on their promises. iFAST is Asia's leading independent investment platform with more than a decade of experience. We provide investment solutions to financial advisers, financial institutions, fund of funds managers, pension fund managers, retail and high net worth (HNW) investors, family offices and multi-national companies. 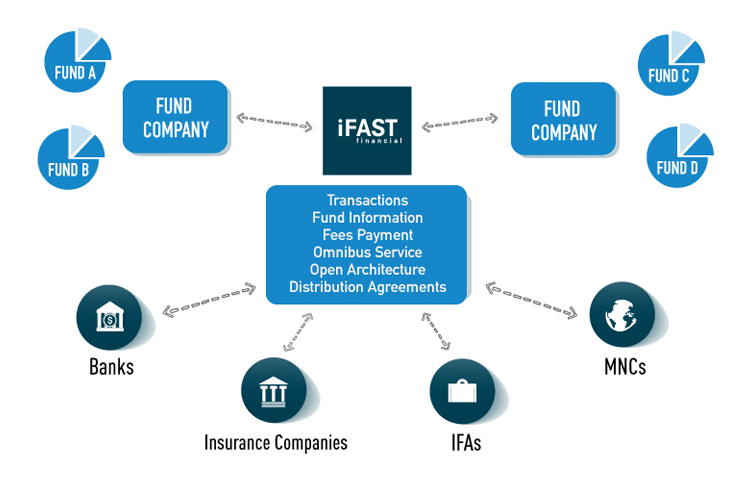 iFAST leverages on a proven and award-winning technology and powerful tools to deliver seamless and automated online fund trading and administration services. From dealing to settlement, fund setup and provider management, reconciliation, custody, pricing, trailer fee management and transaction, iFAST Institutional Services make fund trading efficient and convenient.